MJX Bugs 2 Drone Review 2019 – is the MJX Bugs 2 quadcopter worth the money? Review of features, pricing, flight duration, battery, camera and more. MJX (Mei-Jia-Xin) is a Chinese firm based in Hong Kong that specializes in producing affordable yet capable entry-level and intermediate quadcopters. 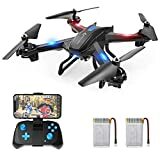 The company is most famous for their bug series drones which have quickly become popular among kids and amateur drone pilots. The MJX bugs 2 is the successor to the highly successful Bugs 3, released a year before. Like the MJX bugs 3 before it, the bugs 2 sports high-performance brushless motors and a sleek design. Overall, the Bugs 2 is a definite upgrade over the bugs 3 with improvements in virtually every sphere. Below is an in-depth review combing through the B2W’s features, pros, cons and how it compares to other drones in its class. The MJX bugs 2 comes in two different models; B2C and B2W. The B2C is the base model and is only available in white. The B2W, on the other hand, is the better of the two models and has the superior spec sheet compared to the B2C. In addition to all the standard configurations in the B2C, It includes First Person view (FPV), a feature that lets you see where you’re flying from the perspective of the drone. The inclusion of an FPV feed makes the B2W the better buy. Before flying the drone, you ought to make sure the remote is bound to the drone. First, you need to plug in the battery until it clicks. Putting in the battery powers on the drone. With the remote powered, proceed to grab the remote then press and hold the red button until you hear a beeping sound. Beeping signals that the remote is now connected to the quadcopter. Design: The Bugs 2 design is quite similar to its predecessor; the bugs 3. It has four separate motors on each corner of the craft. The brushless motors pack a punch providing plenty of thrust during flight. The brushless motors have their fair share of advantages over brushed motors such as higher power output, improved torque, less maintenance and reduced risk of engine failure. 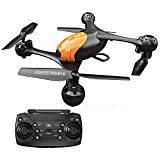 Despite its affordable price tag, the drone boasts a solid body construction made of sturdy ABS plastic; a material commonly used in helmets and automobiles. When it comes to dimensions, the Bugs 2 drone measures 16 x 16 x 3 inches. Camera: As far as the camera goes, the MJX Bugs 2 quadcopter comes with a full HD 1080P Camera that supports Wi-Fi FPV. The camera can shoot aerial footage in 1080p resolution at a solid 30 frames per second. Image quality is also outstanding, especially for daylight photos. The bugs 2 does have FPV support via Wi-Fi but only on the B2W variant. Live FPV video feed is accessible via an app which can be downloaded to your smartphone. While the Bugs 2 drone does have a good level or aerial stability thanks to its excellent propellers, it still lacks dedicated software and hardware image stabilization. FPV, GPS, and Advanced features: one of the biggest upgrades of the Bugs 2 over the Bugs 3 revolves around the inclusion of the GPS navigation system. The integration of GPS enables the Bugs 2 to have advanced features such as follow me and one key return-to home, features that were not present in the previous model. First person view (FPV) is a must-have feature for modern-day camera drones. The Bugs 2W boasts 5 GHz of wifi FPV connection which experiences minimal lag and works well over 500 meters. While the Bugs 3 still is a fun ready-to-fly drone, its successor is even more interesting. For starters, the bugs 3 lacks the GPS navigation system now present in the Bugs 2. Secondly, while the bugs 3 has a flight range of around 300 to 400 meters the bugs 2 has a maximum range of about 1000 meters. While the bugs 2 provides a 1080p shooter, the bugs 3 lacks a dedicated onboard camera but instead has a versatile mount to pair with GoPro and other action cameras. In the camera department, both units are well-equipped; however, the bugs 2W’s 1080p shooter provides better and sharper images than the 720p shooter on the CHEERSON CX 23. The bugs 2 is also the clear winner when it comes to flight performance; its 18-minute flight time is superior to the 14-minute flight time on the CX 23. However, it’s important to note that the CX23 does sport the superior 5.8G FPV transmission. GPS and GLONASS support is a key selling point of the MJX Bugs 2W. The inclusion of GPS allows the drone to have more than 15 satellite connections at any given time. 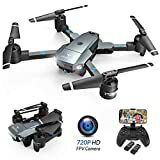 Consumers are also impressed by the drone’s attractive pricing given it packs advanced features such as GPS and FPV which are more synonymous with high-end quadcopters. Its 1080p camera has been praised for its ability to capture good-quality stills and aerial footage. The only downside is that its battery takes a quite a long time to recharge fully. The MJX bugs 2 is a budget ready-to-fly drone that’s perfect for people looking to get into the world of quadcopter flying. 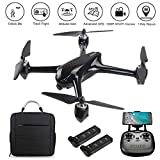 However, don’t let its low asking price deceive you; the drone boasts a plethora of advanced features such as headless mode, altitude hold, one key return to home as well as FPV mode. While it doesn’t offer compatibility with GoPro and other action cams, its 1080p Full HD camera can still take decent photos and videos. The MJX bugs 2 drone is no doubt a contender for the best drone under $200.